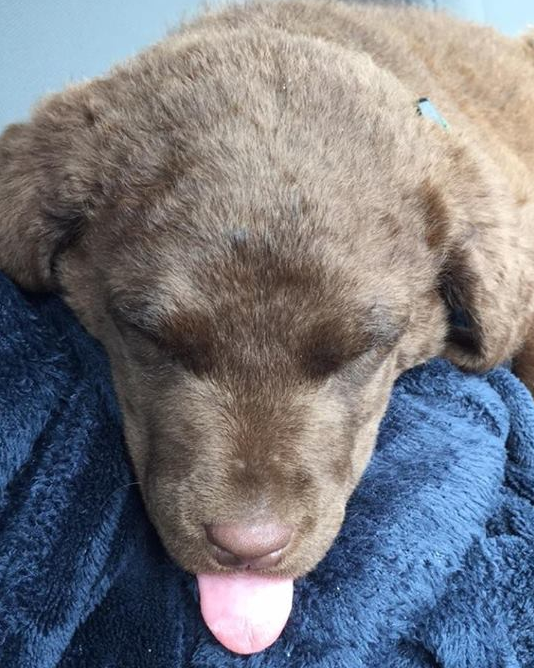 ​We have owned Chesapeake Bay Retrievers since 1991 and have been breeding Chessies since 1996, and welcomed some beautiful puppies into this world. We sell our puppies for show, obedience, hunting, performance events, and for family pets and companions. ​We only use the breeding stock that passes the OFA (hips), OFA (elbows), CERF (eyes), DM (degenerative myelopathy), and EIC (exercise induced collapse). Most of our Chessies are champions in the U.S. and Canada. ​Our first experience with Chesapeake Bay Retrievers were as our pets and family companions since 1991. 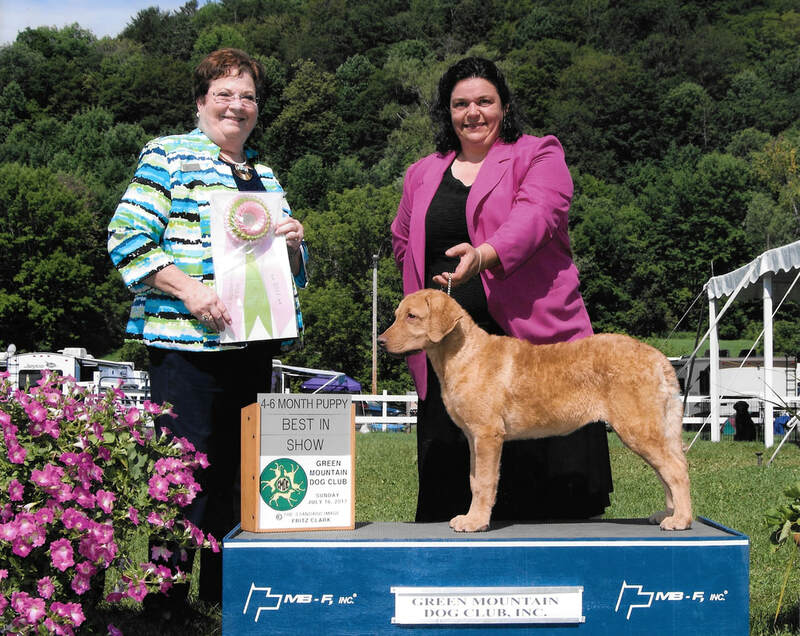 We got our first show dog in 1996, "Sassy" (Am & Can CH Von Hausman's Sassy Spitfire). Sassy went on to be ranked sixth in the United States in 1999 in conformation and was pictured in the 2003 National Brown Trout Chesapeake Calendar. 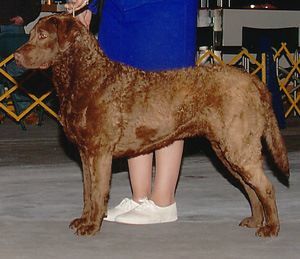 In June of 2008, Crystal and her first Chessie "Shilo" began showing in conformation. In October of 2008 at the Chesapeake National Competition, Shilo and Crystal took first place in the 9-to-12 month class. 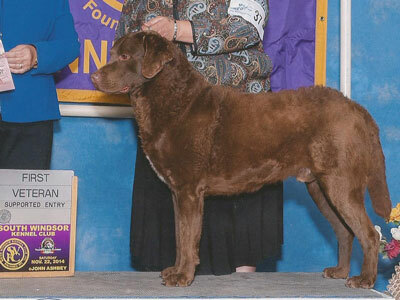 They Continued to show in conformation where Shilo earned his GCH (grand championship) in AKC with five Majors. Shilo is now GCH CH Green Mountain Shilo RN, CGC, CGCA, TDI, RLV, THDN, CGCU. Am & Can CH Von Hausman's Sassy Spitfire -- "Sassy"
GCH CH Green Mountain Shilo -- "Shilo"
Green Mountain's White Lightning -- "Streak"
Now we are working on "Streak", amongst others. Streak is our all around Chessie. He loves to work with Crystal and learns at a fast pace. Streak is Green Mountain's White Lightning S.T.A.R., CGC, RN, RL1, RATI, RATN, RATO, RL1X so far. Check out Streak's fun new video earning his titles in Barn Hunt on our GMC Facebook Page! We compete in conformation and performance events with AKC (American Kennel Club), CKC (Canadian Kennel Club), BHA (Barn Hunt Association), WCRL (World Cynosport Rally), CPE (Canine Performance Events), and TDI (Therapy Dog International). At 4 months and 1 day old "Buttercup" (BPIS Green Mountain's Blossoming Buttercup), took Best Beginner Puppy in Show in Tunbridge, Vermont on July 16, 2017 under Judge Mrs. Pamela B. Peat. 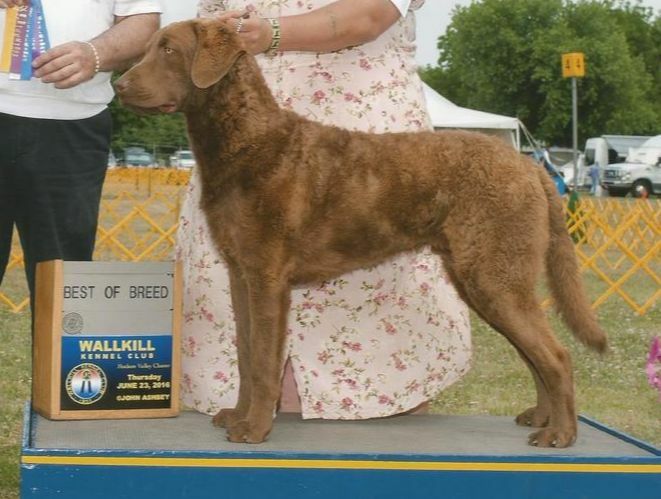 Buttercup is our very first Chesapeake Bay Retriever to earn a Best In Show!!! BPIS Green Mountain's Blossoming Buttercup -- "Buttercup"
​Site Designed and Maintained by Emily Ianni.